I'm just gonna be blunt about it because I've written and then deleted the start of this tutorial about 67 times so far. The "Check for Updates" feature in the Silhouette Studio is basically useless. There...I said it. If you're running Silhouette Studio and you're relying on that little feature to make sure you're running the latest version of Silhouette Studio - you're making a huge mistake. It doesn't work the large majority of the time. In fact I'd be willing to bet my much-needed morning cup of creamer with coffee that at least half of you reading this right now aren't running the most up-to-date version of Silhouette Studio....despite believing you are! The problem is, when I check my current version of Silhouette Studio, I can see I am running Silhouette Studio V3.7.206. That's an old version of the software. 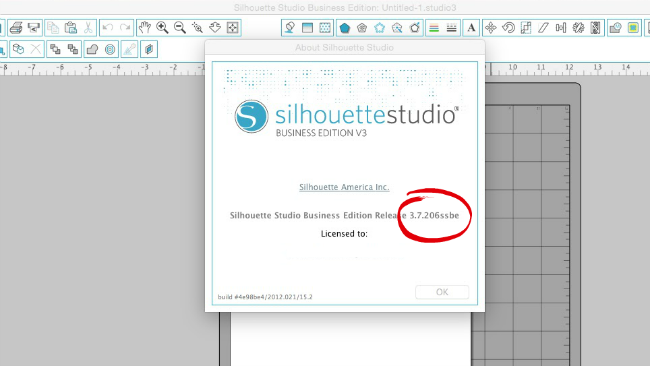 Click here to read a tutorial on how to check what version of Silhouette Studio is running. I know it's an old version of Silhouette Studio because when I cross-check on the Silhouette America website, I find the most most up-to-date version is actually Silhouette Studio V3.8.088. This is why it's so important that you routinely check for Silhouette Studio updates - which often fix bugs, make the software more stable and add new features - directly from the Silhouette America website. It's also best that you download the latest version of the software directly from the Silhouette America website and not through the software. Thanks, Melissa! Who knew? Well, you, of course. please help me. my heart is broken. i upgraded to the latest edition and now my entire library is gone. thousands of files. please tell me that there is away to retrieve them. thanks. Linda the same thing happened to me! After I panicked I restarted my computer and reopened Silhouette. Click on File (I think) on top of the screen and click on update library. (I think - Sorry, I am at work and I don't have my Silhouette in front of me) After the library updates, you might have to update the cloud also. After I updated both the cloud and library my files were back. Good Luck! What if you've upgraded to designer? Are there any special step that need to be done? Totally agree!! I did the Check For Updates check before I went to a class since I was told to be sure I had the latest version...had the software tell me "No Current Updates" available and then had to spend over half the class waiting for my software update. I was maaaaaaaaaaaaaaad! Sent a message to Silhouette...and was told they're working on it. And I see in the two years since I took that class they've done nothing. So, I think it's a good thing you posted about it. It's a flaw that needs to be fixed. If they can't figure out how, then just remove the option to check so people aren't thinking they're running the newest version - easy! WOW!!! Like many of you I checked and was told I didn't have any updates. With this tutorial I went to Silhouette America and sure enough I was several, yes several updates behind. Can't wait to see if the updates help with a couple of areas that frustrate me:) Thanks so much!!! Thanks Melissa. Learn something new everyday from your postings. Ummm, I updated and my files are GONE! all the svgs I had are just gone. Thousands of designs. I upgraded last week and when I go to the cloud in my library (I didn't have the cloud before), it says it is synced, but it only has about 20 files now. On the other hand, my library went to over 5,000 files! It multiplied files and in a lot of cases, I have 4 or 5 of the file. I just upgraded my Silhouette as well. I was working on a project that is using the registration marks. I was able to cut one of the pages but when I tried to cut another one the registration failed message came up. This was working fine before I upgraded and had cut out about 10 sheets. Do you think I need to do something else to get this working again? I'd like to know how to go back to an older version. I got a virus on my computer and had to download the software and Designer Edition on another computer which only gave me the newest version. I would much prefer to have the older version back! Locate & select "Silhouette Studio"
Went to the web site and downloaded the latest version for Mac and after checking what version I was running it said I was still running the 3.7 and not the 3.8. Why is this so frustrating to so many people? Come on Silhouette get your act together! Melissa, you're tutorials are excellent! But I have to say that although this is one of the simplest, it's one of the best! I, myself, will not be upgrading to the latest version for quite some time! I just got off the phone with Heather, from Silhouette. My problem: I upgraded from 3.6.57 to 3.8.88 and it kept crashing - would stop at 22.2%; I'd abort, and went to the "Update Library" and it would stop again. Not only that, but the second time I did it, it duplicated the images, so now I had two in the library! My computer wouldn't finish the library update. It's my understanding that the 3.8.88 is for storing stuff on the Cloud which I don't want to do for various reasons. Long story short: I uninstalled the current version and re-installed the version I had (which was doing just fine, by the way). Everything was restored perfectly and I'm "back in business." How to delete "new version" and re-install "old version:"
Thanks, Dawn. I downloaded the update and had nothing but problems. When I tried to update my Library, it froze at 12.2% and wouldn't budge no matter how long I gave it. I used your instructions to revert back to my previous version. Awesome advice! Now I have access to the Silhouette cloud! I may be new to all of this (3 months), but I always go to the Silhouette site to check. Thanks for looking out for us Melissa. At this time I'm being cautious about upgrading anything on my Mac Pro laptop. It's a few years old, and recently we found updating external things on our desktop was causing some problems. Make sure you check your computer or laptop memory ESP if it's not fairly new. Many current programs have memory requirements for installation....and if your computer is not able to handle the new version if something it will not load, it may load then not run or it could crash. We replaced the desktop and the newest macs have WAY more memory to start than our old one. All I want for Christmas this year is a new laptop...one that has enormous capacity to handle what is coming down the pike as well as the stuff I'm being careful with NOT doing with my sewing machine, cricut or silhouette at the moment! So I switched back to my old version 3.6 which I will stick to for a while. Glad it is easy on a mac to have several versions, I did not delete the old version. But you can get old versions too at silhouette. I too lost hundreds of files once, well, not the files, only my structure and links. misskatecuttable is much better with different file types (svg, jpg, png) and instructions. SO: DO NOT UPGRADE Silhouette studio if possible. Thank you for this posting. I was surprised to learn my software was several editions out of date. If I uninstall the silhouette software on my computer and re-install the old version will I lose all my files? Thank you, Melissa g. Your advice worked like a charm & I did NOT lose a single file - big sigh of relief! Thank you! Found out I was several releases behind. I was really hoping that the newest version would fix the problem I have consistently had since V.3.6057 which was the software crashes EVERY TIME I try to close it, whether it is quitting from the menu or just hitting the X in the upper right hand corner. I have tried quitting from the design screen, the store screen, and the library screen, it always crashes. I have tried closing all open files, saving files and closing them, everything. It still would crash. So it was with bated breath that I opened the latest version after installing it and quit the application. AND....it crashed. Again. I can find no support question on their website dealing with how to fix this. It's annoying because I have to recalibrate the camera for use with the Pixscan because that does not get saved because the stupid software crashes instead of closing out properly. I can still use it, it's just ANNOYING. Yeah just be careful because when I updated EVERYTHING I had put in my library was gone. I had done a back up before and Silhouette won't read the back up!! I LOST SO MUCH!! Now I'm rebuilding my library but also keeping Svgs in a folder on my hard drive that I back up. Thank you for this, I was so far behind in updates. Help! i updated to newest version and lost all my library. when it was trying to export to cloud - there was an error and it wouldn't let me send a report and wouldn't do anything so i had to close it down.... I've gone onto Silhouette America site and downloaded my purchases but i had so many of my own designs and now they are gone.....is there anything I can do???? I'm confused. I upgraded to DE a couple of weeks ago and find that I don't have the latest version. But DE isn't listed in the update page at Silhouette America - or in the screenshot above. 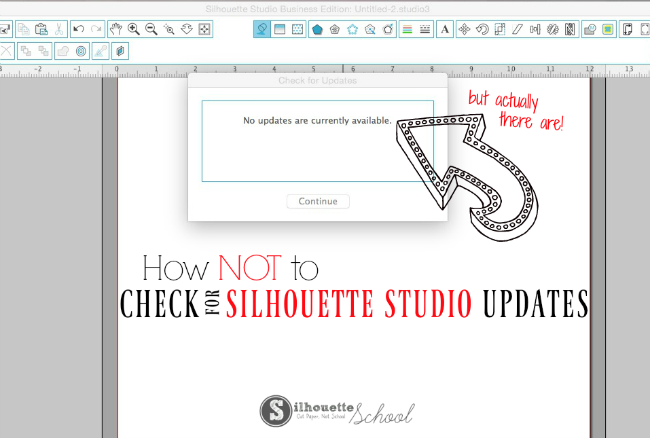 How do I update Silhouette Studio DE? Looks like I'm one of many who updated and lost a most of my files. I followed the steps to update the library, but only got copies of the few that were left - Also, my print & cut feature is not working- not fun! I have enjoyed my Cameo for several years, but now I'm pretty frustrated with the software. OMG!!!! I just updated my silhouette by going on line to the website and now all of my own designs and my the files that I adjusted to print multiples and different color cardstock are ALL GONE. I have a humongous amount of them and I need them back! I was just working on one that I was going to use for Christmas gifts and to take to a crop I have in another week! In fact the folder name is missing and I have 2 different sets of design listings in my library and they are not the same. Why do I have 2 different sets of folders? I need help! I need all of my personal designs back! Every time I try to update I can never open the program! I just get "loading icons ....." And it never stops. :( I'm still running v 3.3 because anything after that has given me trouble. THANK YOU HEATHER! My program must have auto updated and it wouldn't work anymore. After pulling out about half my head of hair I came across this post, and your comment. I uninstalled (again) and then re-installed an older version - works fine! THANK YOU!!! !